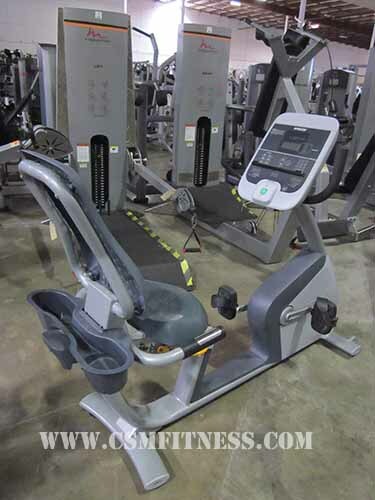 Precor RBK815 Recumbent Bike: The Precor RBK815 Recumbent Bike is designed for maximum user comfort and accessibility. The patent-pending Air Flex Seat with ventilation allows the seat back to move and also features 11 levels of adjustment for user comfort. Seat adjustments can be made while off the bike or sitting on the bike. The seat is in an optimal position to encourage efficient pedaling and reduce force on the knee. With this design the knee is placed directly over the ball of the foot when the pedals are in a horizontal position. The dual-sided pedals come with removable straps to comfortably accommodate all feet sizes. The crank arm also accepts any standard road or mountain bike pedal. The bike features two-step powder coating, which gives a rust-resistant finish. There are 25 different resistance levels and 9 different languages to choose from. These options are all featured on the LED touch screen display.